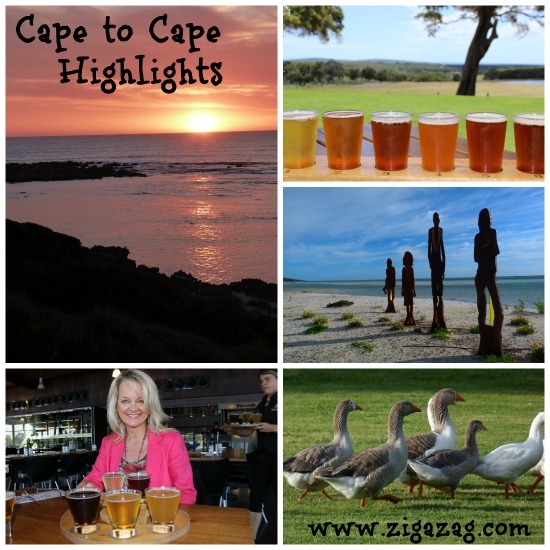 This post about a Cape To Cape road trip in South West Australia was sponsored by Nuffnang. Cruising between the two capes of the south west region of Australia on a sunny summer’s day, I think, is about as close to nirvana as you can get. Windows down, music blaring (today it’s Lana del Rey) and we’re off on an adventure. Yay! We’re going on a road trip Australia! 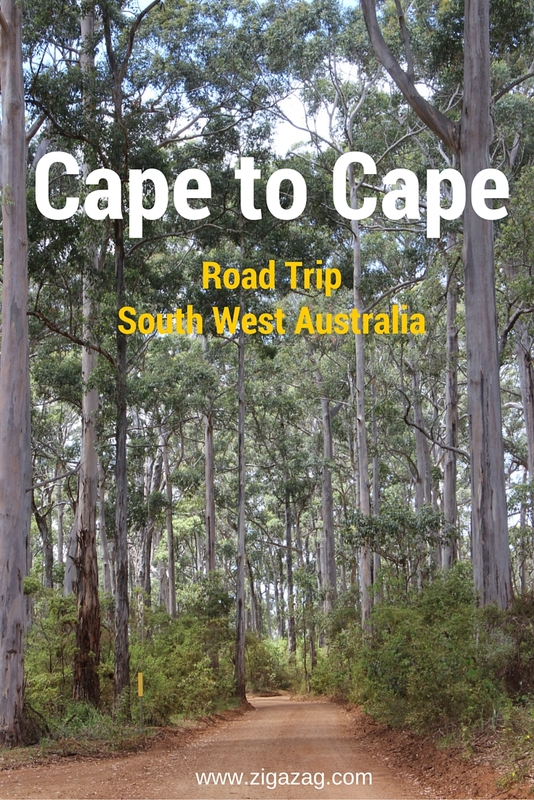 The Cape to Cape drive covers around 143kms (including a couple of detours) and starts at Cape Naturaliste then heads south through the Margaret River Region which has been named one of the Top 10 places in the world to visit by Lonely Planet. The south west corner of Australia is an ancient land, which for millions of years was cut off from the rest of Australia by desert. It consists of tall Jarrah, Karri and Marri forests, natural bushland, wonderful beaches, a fascinating cave system, and flora, much of which is found nowhere else in the world. In fact, it’s known as a biodiversity hotspot. It’s pretty simple really. 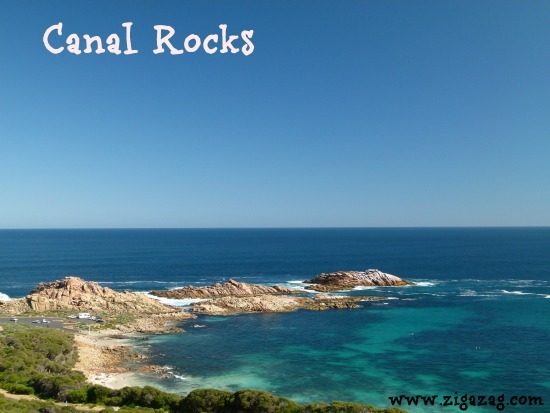 From the northern cape at Cape Naturaliste (Three top Places to Visit around Cape Naturaliste) to the southern cape at Cape Leeuwin – taking Cape Naturaliste Road, Eagle Bay Road, Meelup Beach Road, Caves Road, Wallcliffe Road, Hamelin Bay Road, Bussel Highway and Leeuwin Road. Total Distance +- 143 km. 1. Starting at Cape Naturaliste Lighthouse (13 kilometres from Dunsborough) we wound our way along Cape Naturaliste Road (in the direction of Dunsborough). You could turn off right for a short detour to Sugar Loaf Rock, a rugged part of the coastline, with some fabulous photo opportunities. However as we’d been there before, we continued in a south easterly direction until we came to the intersection with Eagle Bay Road. Turning left along Eagle Bay Road we passed Wise Wines and Eagle Bay Brewing Company, (Beaches and Breweries ) then drove down the hill to beautiful Eagle Bay with its million dollar houses set high on the hillside overlooking the ocean. Glimpses of various little bays from parking areas along Meelup Beach Road afford fantastic views of coastal scenery. Cape Naturaliste Lighthouse – 20 metres high, landmark, interesting maritime history. 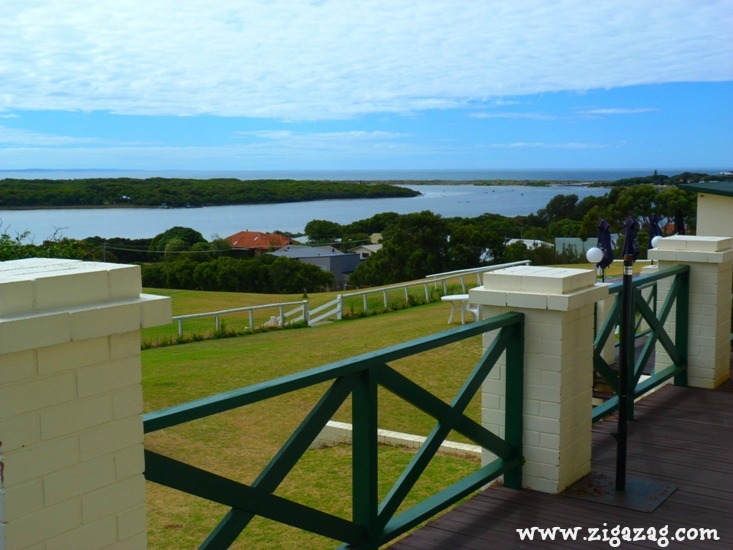 There are fabulous views of the Indian Ocean, Cape Naturaliste, Leeuwin-Naturaliste National Park and Geographe Bay coastline from the top balcony of the Cape Naturaliste Lighthouse. At its highest point the lighthouse is 123 metres above sea level. A platform and shelter provides whale watching opportunities during the annual migratory periods, from September to December. Drinks, snacks and souvenirs are available for purchase in the first cottage. The boardwalks at Cape Naturaliste. That’s Sugar Loaf Rock in the distances. 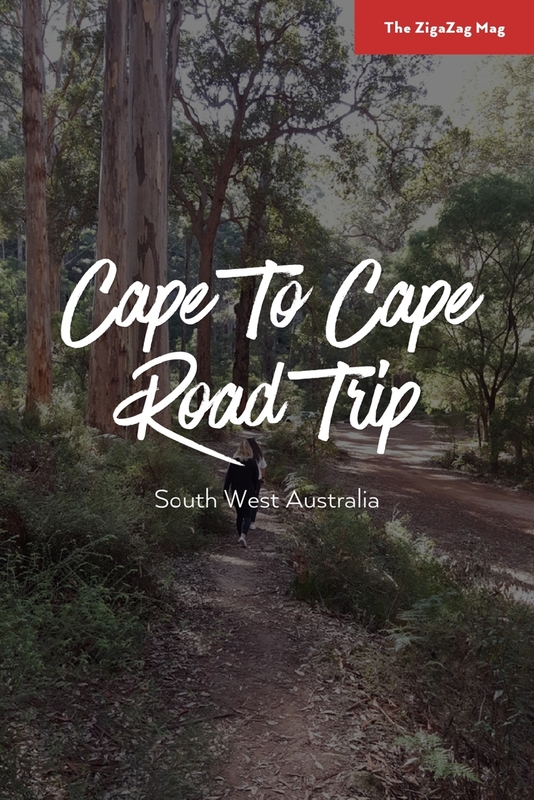 Cape to Cape Walking Trail– At the Cape Naturaliste car park you’ll find the start (or end) point of the trail, a coastal hike that spans 135kms between Cape Naturaliste and Cape Leeuwin along the Leeuwin-Naturaliste Ridge. It’s well worth doing. For a short walk, you can just take a stroll along the boardwalks at Cape Naturaliste, and take in some fresh sea air and views. The Cape to Cape Track stretches for 136kms and takes in some glorious beaches and takes you to townships like Yallingup and Gracetown too. 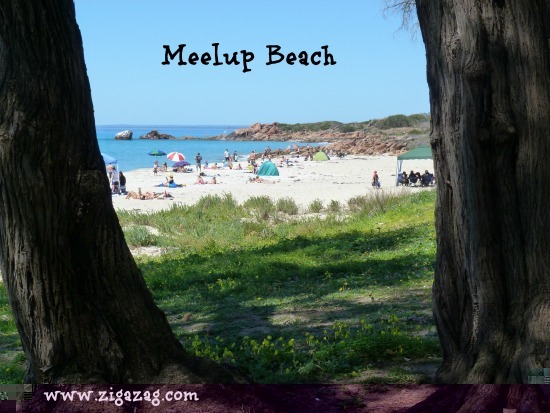 Meelup Beach itself is a picturesque spot with shady trees, green grassy areas, barbecues, a pretty coastal walk and family swimming. I’m told that on full moons, many people take picnics to the beach to watch the moon rising over the water. 2. Continuing along Meelup Beach Road, there’s a road turning down left to Castle Rock, which would take you to another pretty beach, also with a path linking up to a coastal walk which you could take all the way into Dunsborough. We’ve done this walk previously, ending up in Dunsborough for a cup of coffee and cake. 3. 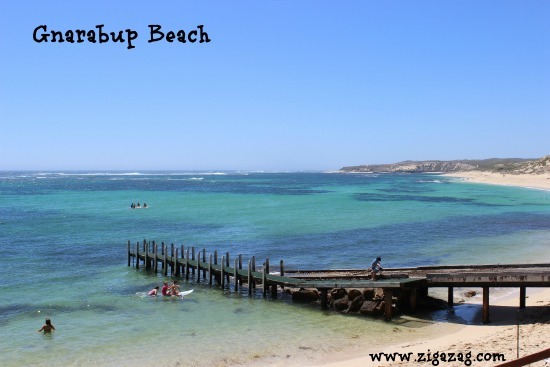 We drove along Meelup Beach Road to the T Junction, and turned left, taking us back onto Cape Naturaliste Road heading to the holiday town of Dunsborough which has some good restaurants and interesting boutiques, along with a beautiful beach. Dunsborough is clean, and bright with an air of sophistication about it. 4. Turning right onto Caves Road we continued meandering, past 5 Star Empire Retreat (Beaches and Breweries Part 2) and Windmills Break (10 Great things to do around Yallingup), both fantastic places to stay if you fancy letting the monkey loose, or for a special occasion perhaps. The road here is slightly wooded as you cross the ‘witches hat’ part of the Cape (it looks like that on the map!) turning away from Geographe Bay and driving westwards towards the Indian Ocean. You’ll pass the fantastic Ngilgi Caves on your right, well worth a visit, and as you reach the other side of the ‘hat’ you have the choice to head straight on to Yallingup or take a left turn and keep on Caves Road heading south. Yallingup – what’s not to love about this coastal enclave with its beautiful houses tumbling down a wooded hillside? There’s a cafe and a children’s playground and a family beach with a protected lagoon good for snorkelling. Great views across to Smiths Beach from two look-outs. Be at a Yallingup look-out for a sunset and you won’t be disappointed. 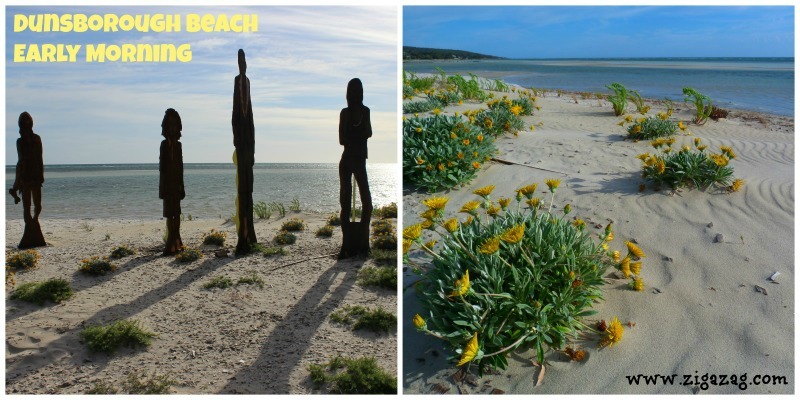 Around Yallingup, you’ll also find some fantastic art and jewellery galleries. 10 Great Things to do around Yallingup. 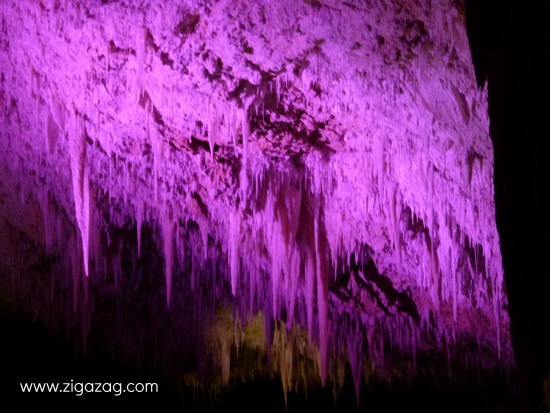 As you head south you’re actually travelling over an underground wonderland because in this area there’s a hidden labyrinth of limestone cave systems formed over one million years ago. Around 100 caves have been uncovered, but only a few are open to the public: Jewel, Moondyne, Calgardup, Lake and Mammoth Caves are accessible (some are self guiding) and each one is unique in its own way. Interesting Fact – Marsupial lion, giant wombat, the infamous Tasmanian tiger and also giant kangaroo remains have all been discovered in the caves. Tiny creatures called stygofauna that date back to around 65 million years ago can also be spotted with a keen eye. 5. From Caves Road you could also take a slight detour from the route south, and instead take a right turn onto Canal Rocks Road which will take you to the lovely Smiths Beach (where there’s a great restaurant called Lamonts) and then drive on to Canal Rocks itself which is a picturesque spot with fabulous views. 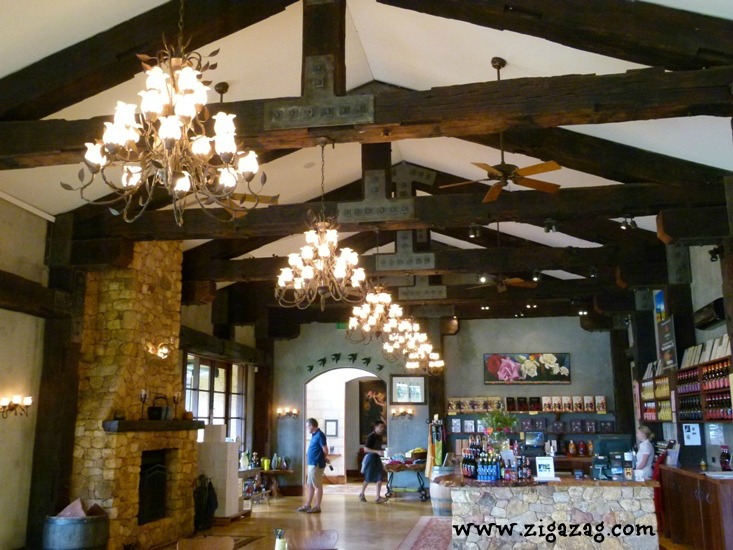 Wineries and restaurants – there are over 150 wine producers in this area. It’s known as the Margaret River region, and the network of criss-crossing roads that lead off Caves Road at various places, are home to many of them – these roads and the wineries are well worth exploring if you have time. You’ll also find attractions like a chocolate factory and an olive oil factory producing face and body products too. 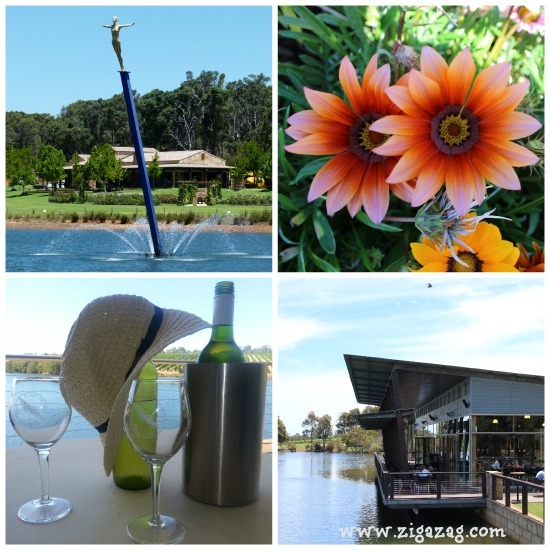 You’ll find world class winery restaurants for lunches, interesting architecture, art galleries and gift shops. You might like to read: 11 Margaret River Wineries with a difference. 6. You could take detours from Caves Road to the quaint town of Cowaramup and further south veer off along Carter’s Road to Margaret River itself, but we stayed on Caves Road until we came to Wallfliffe Road where we turned off right to Prevelly, a small settlement with a picturesque Greek Orthodox Church that has an interesting history. Almost next to this, at the general store adjacent to the camping site you can find an interesting book that will tell you all about its history and why Prevelly was built. Next to the store is a laid back, family restaurant called Sea Gardens with great views. Where are the waves in this region? Windmills, Three Bears, Yallingup, Injidup, North Point, South Point, Surfer’s Point, Lefhanders, Grunters, Gas Bay, Redgate and Boranup. For more information about the Margaret River Region, maps, books and where to stay advice, contact the Margaret River Visitor Centre. Boodjidup and Gnarabup – adjoin each other. Great for stand up paddle boarding and swimming. There’s a boat jetty. The beachside White Elephant restaurant is open during the day and has truly fantastic views. Conto’s – has a fantastic high ridge behind it. Great for swimming and surfing. 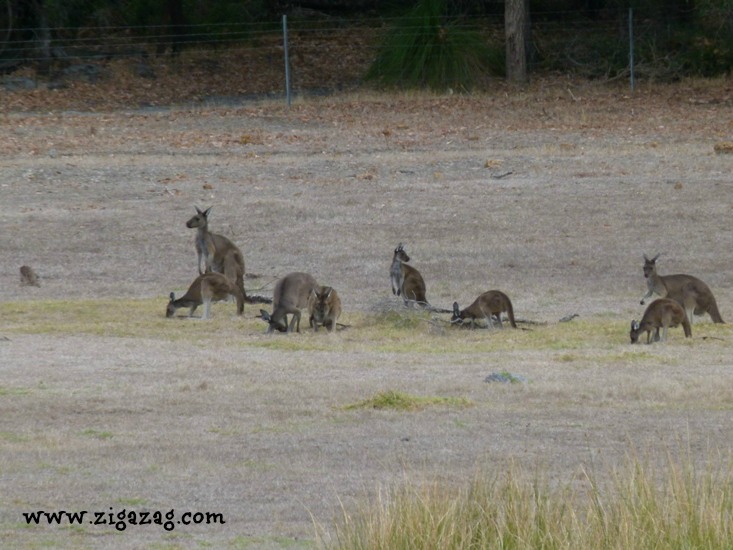 Gracetown – In a bay, has two surf breaks. Cafe close by. 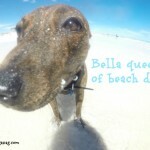 Redgate – a stunning stretch of beach, surf and swimming areas. Hamelin Bay – snorkelling, swimming, and stingrays. Small general store. Smiths – a wide sweep of beach sheltered from the southerlies. Lamonts Restaurant close by. 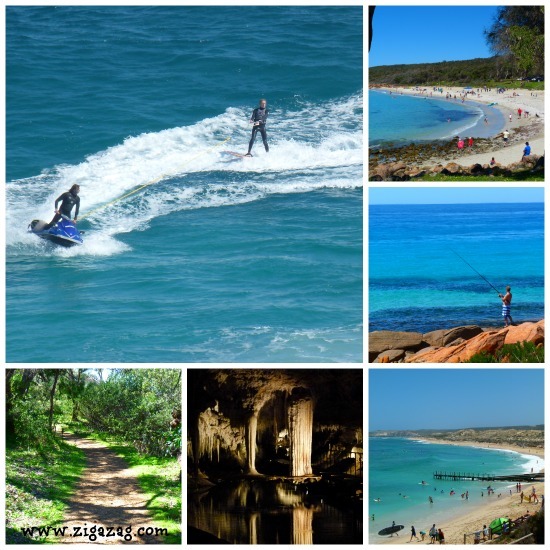 Yallingup – has a protected lagoon – great cafe and play areas. 7. Time to drive back along Wallcliffe Road and right onto Caves Road, heading south again, not veering off to the lovely Redgate Beach this time (well worth a visit). We continue past more wineries and drive on past Calgardup Cave, Mammoth Cave and Lake Cave – ” Margaret River Caves” – at Lake Cave there are some tearooms with a gift shop right in the forest. Tip: If you’re booking cave tours ask at the Augusta and Margaret River Visitor’s centre about packages – sometimes you can buy a package for two or three caves and a lighthouse tour. A little further on, and on the left is the Boranup Gallery, a great place for large and small gifts – and a small café, which also juts into the forest. Watch out for Splendid Blue Wrens. 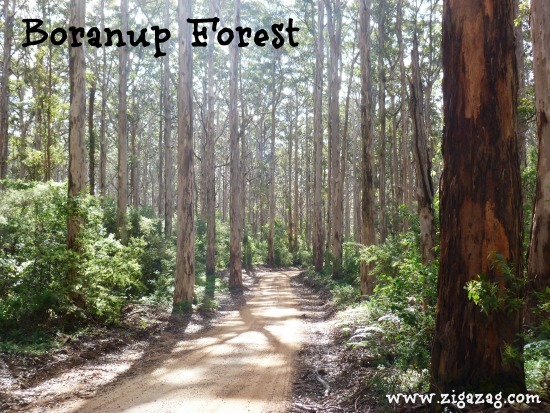 Boranup Forest – a dense and beautiful forest of Karri trees which can grow to 90 metres high. Early morning or late afternoon, when the sun is shafting through the trees, is a great time to stop at the picnic spot (on a most beautiful bend in the road) for photos or a picnic. For the more adventurous you can head off into the forest on gravel roads on a fairly long, dense, loop which will take you back onto Caves Road. 8. On Caves Road and heading south, we veer off to the right along Hamelin Bay Road to the beautiful beach of Hamelin Bay with its holiday park, sunken wrecks, and fishing opportunities. Hamelin Bay was once famous as a bustling port in the days of timber logging when logs were shipped to England. You can see remnants of the jetty on the beach. Here you’ll likely find stingrays swimming in the shallow waters because they come in to feed off the fishermen’s scraps. You can often get really close to them, but beware of their barbed tails – which can be deadly, so don’t get too close. Video Clip of Stingrays: I’ve posted a video of the Stingrays on my LoVe Drives “Cape To Cape Drive” on the LoVe Drives site so click on the link and pop on over if you’d like to check it out along with a MAP of the Cape to Cape route. Want to create a drive? LoVe Drives is an online community for anyone who loves to drive, powered by Shell V-Power. It’s a place to share your favourite drives, filled with information and imagery … or to discover other people’s most loved drives around Australia. 9. Back on Caves Road, and you could detour to visit beautiful Cosy Corner with its lovely beach and headland, or drive on as we did past the lovely Jewel Cave and on to the T Junction with the Bussell Highway. Here we turned right and drove south again to the coastal town of Augusta. Augusta is a small town at the mouth of the Blackwood River. It dates back to 1622 and since then it’s become a popular family holiday hotspot. 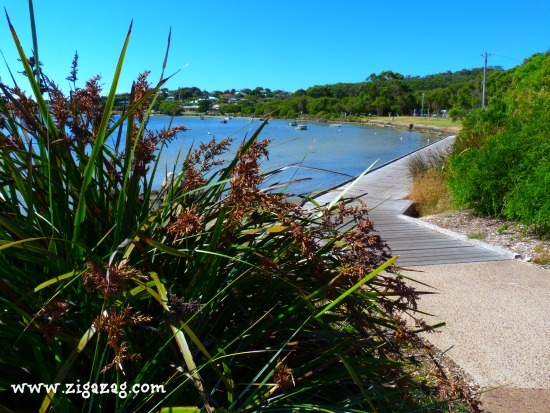 There are some lovely walks along the waterfront.You can also book to go dolphin spotting, or catch boats to take you into the Hardy Inlet and along the Blackwood River. 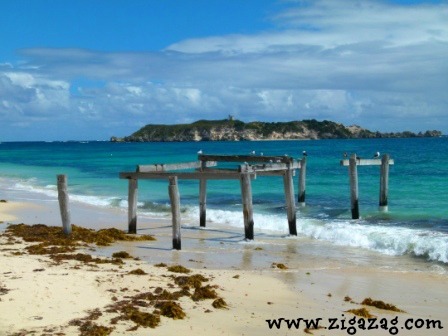 The beach at Flinders Bay offers a good swimming beach and it’s very picturesque. But it’s the lighthouse which gets the Oscar. 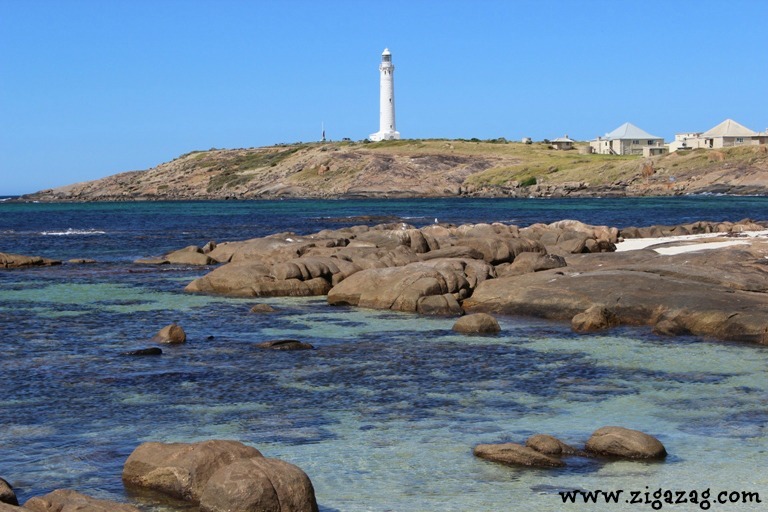 The Cape Leeuwin Lighthouse began operation in 1896. It sits at the point where the Southern and Indian Oceans meet right on the most south westerly tip of Australia. It’s the tallest lighthouse on the Australian mainland. Guided tours and interesting maritime history await you. The Augusta Hotel – Above … the views from the restaurant are just wonderful. Stop for pub lunch type meals and enjoy the vistas. If you’d like a snack then head along the main street to The Augusta Bakery – a great little cafe with views, and fresh baking. The region between the Capes enjoys a mild Mediterranean climate. Summer temperatures rarely rise above 32 – 34 degrees centigrade. Winter is wet and can be chilly (bring warm clothes), and springtime you can expect mild temperatures and sunny days of around 16 to 18 degrees. The spring flowers at this time of year are often wonderful in the forests and coastal walks (2,500 wildflowers and around 150 orchid species can be found in the area). Autumn is mild and days are generally sunny. I love road trips, Johanna. I would be all in for some sushi at The Fruity Cow and then follow it up with some pizza at Eagle Bay Brewing Company. This is one of those ‘something at every bend’ road trips Mike! Pizza and a cold beer at the Eagle Bay Brewing Company along the way would be a great interlude! 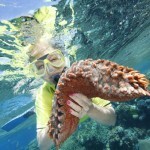 Fantastic detail in this blog Jo – I now know where to go to research my next WA trip! Think I need to add the Coast to Coast walk to my bucket list – looks like a beautiful stretch of coastline. Any decent diving to be had in the area? Hi Deb, thank you. 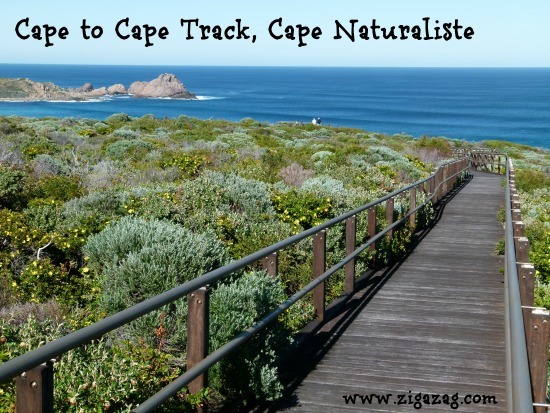 Yes, the Cape to Cape coastal walk is a winner – truly fabulous untouched scenery. Diving – yes I think we have quite a few dive wrecks down this way. I could look into that for you if you’re keen? I love this part of our world! 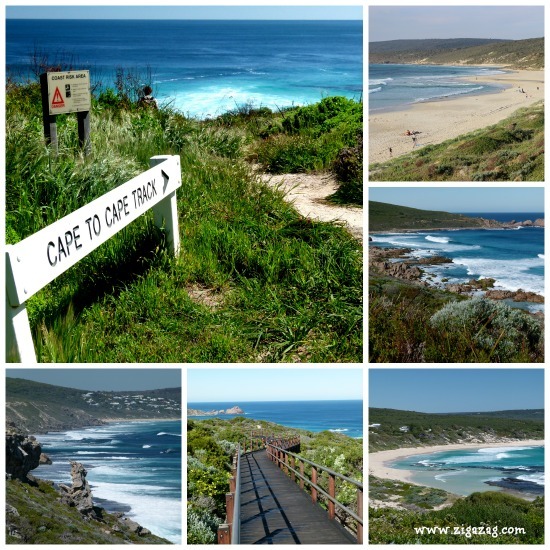 The Cape to Cape walk is one of my favourite walks to do but I’ve never thought of doing the Cape to Cape drive! We so often stay in one or two areas and don’t ever get to the end of the drive…something to remedy next time! Ahhh, hope you do get to do the complete drive all in one go one of these days, Jenny 🙂 Yes, isn’t it a wonderful part of the world, this little corner! I loved how you talked me into wanting to visit the caves and then explained what wild animals live there. Ummm, okay. I’ll just safely enjoy your cave pictures. Each time I see a picture of a lighthouse, I’m so wanting to see everyone of them. What a fantastic road trip. That cave is very intriguing! Gorgeous, gorgeous, I’d love to do this drive using you as my guide. Popping over to check out LoVe Drives. Fabulous – I’d love to be your guide, Seana! Thanks, Nancie! The cave is intriguing, and it’s not the only one 🙂 You could spend a day just visiting the caves in the area. It’s so diverse. Ha Ha Neva! I think the wild animals are long gone, you’d be okay! Aren’t lighthouses mesmeric – there’s something about a lighthouse! That’s good, Kadri! Mission accomplished! I love this corner of Australia. It sure has grown up since we were there. My two favourite things are the beaches and the tall timber country for when we need a break from the beach. Beautiful photos to showcase a beautiful area to drive through. Wow breathtaking! This has really whetted my appetite for our impending trip to the west. Thanks for the very detailed road trip guide. We will be plotting this on the Navman, but I’m not sure about the 136 Km walk – maybe another time! What an absolutely beautiful drive! I love the diverse landscapes and how there seemed to be something new at each turn. Love that lighthouse and I would probably spend too much time at those caves. My husband can probably spend days at the brewery. Wow, sign me up Jo! This trail has many of the things that I like – gorgeous beaches, caves, wineries, breweries, great restaurants etc. Each places is beautiful I may end up hanging out longer. great round up of the Capes Jo. So much to see and do and explore and experience. It is a wonderful corner of our beautiful State. You could easily spend a couple of weeks and still not see it all. Lucky for us we can cruise down there for a day or weekend. I’m always up for a road trip. How nice of you to plan it for me. Thanks! Ha Ha Tracey, just for you. Enjoy! Road trip experience are unforgettable.Even though Australia is my own country & I live in the most amazing city. Nothing like a road trip for the heart and soul, hey Nicole! Ah, I have not yet gotten to Australia! It is certainly on my list, especially after seeing this! This is stunning Jo. It’s just a never ending itinerary of delights. So much choice and all so close together. What else could anyone want in such a geographically small region of the world? It must rate as one of the most varied road trips don’t you reckon, Wanda? Great post, and love the photos. This part of the south west is a favourite of mine; I love the beaches and the karri forrests are stunning. We try to get down there at least once a year, and the more the better!